After Mom and Dad were married in the church of St. Nicolas du Chardonnet in the Latin Quarter of Paris, they walked to the Ile St. Louis to a little café there to look at Notre Dame and its flying buttresses from the back, Dad’s favorite view. My Dad had visited the little town and major art center of Céret in the Pyrenees in the 1950s. Back then, Céret had a town crier who would ride around on his bicycle to the various neighborhoods. He would carry a bugle with him and when he arrived in a neighborhood, he’d get off his bike, play a few set notes on his bugle to let people know he was there, and then get out his cardboard megaphone and announce through it the important events of the day – social events, city news, as well as upcoming events. A town cryer in the town of Dorpsomroeper, probably The Netherlands. Notice the bell used to announce his arrival. In those days, in summerevenings before it got dark, many inhabitants ofthe town would promenade along the main street in Céret, 100 or more strong. They would first walk in one direction and then in the other, in a loop. That way they would pass other people face to face and could greet them and socialize a bit. This street is now called Place Pablo Picasso to commemorate Picasso’s sojourns in Céret in the 1910s. A passegiata (promenade) in Perugia. In the winter evenings, they had a big stove in the middle of the Gran’ Café where you could sit down and get warm. In the evening, there was usually a group of men (never women) who would gather around the stove and talk. One night, Dad made a sketch of four or five of these men gathered around the stove. He said it was a pretty good sketch. He mailed it home to his parents in Cincinnati but his Dad wrote back making a “stupid joking remark” about these characters and made fun of the sketch. So the drawing is lost. Don Juan Carnaval before being set alight in a Spanish town. The inhabitants had some strange rituals such as the burning of “Carnaval” – at Carnaval, or Mardi Gras, they made a life-sized rag doll dummy representing Carnaval and then carried him through town before setting fire to him. Le Couvent des Capucins, André Masson 1919-1920. Frank Haviland, the wealthy patron of Picasso and many other artists, had bought an old monastery called Les Capucins and renovated it. In the process, he had pierced a wall in the back of the church to make a little veranda, which wasn’t appreciated by everyone as it was seen by some as disfiguring a sacred building. That was before Limelight. A Catalonian woman, Lee Kemble, in The Cincinnati Enquirer, December 30, 1956. When the women reached 40 or 50, they would all dress in black. Thewomen used to wash their clothes in a little pond, they would gather in the open air near the pond on the outskirts of town and wash their clothes. They had an old wooden soap box and they would cut off one end of it so they could kneel in it and keep their knees dry and put a washboard into the water and scrub on that. They seemed to like that, and gossip. Before Dad left, the city of Céret built an ugly cement block washhouse with concrete basins right in town, which was supposed to be a big improvement but Dad thought it was awful, because he thought the women preferred it before when it was on theoutskirts of town. And it destroyed the natural picturesque aspect of the washday. Article about three painters exhibiting in Céret in the Perpignan paper, 1950s. Dad’s friend Paul Guitard wrote an article about Dad in the local paper but it’s signed by someone else, a certain L. P. The article was about three painters in town at the time: Dad, Frank Burty (Frank Haviland’s full name was Frank Burty Haviland), and Simone Delaunay. Simone and Dad were kind of competitors in Céret, Dad having a show in the Gran’ Café while she had a show right across the street. Paul Guitard called Simone “La Dame aux Sept Couleurs” – the woman of seven colors. Paysage de Céret, Simone Delaunay. Simone and Dad had gotten along really well so Dad wanted to name me after her, but Mom intervened so "Simone" is just my middle name. Simone and Paul Guitard were something of an on-again/off-again item. At one point, Simone had rebuffed his advances and Paul threatened to commit suicide on her doormat (paillasson). Sr. Carita, Liz, Lee, Stephen, and Margot with Notre Dame in the background. Three or four years after leaving Céret, Dad was riding his motorbike across a bridge behind Notre Dame when he came across an artist painting the back view of Notre Dame, and all of a sudden he realized that it was Simone Delauny. 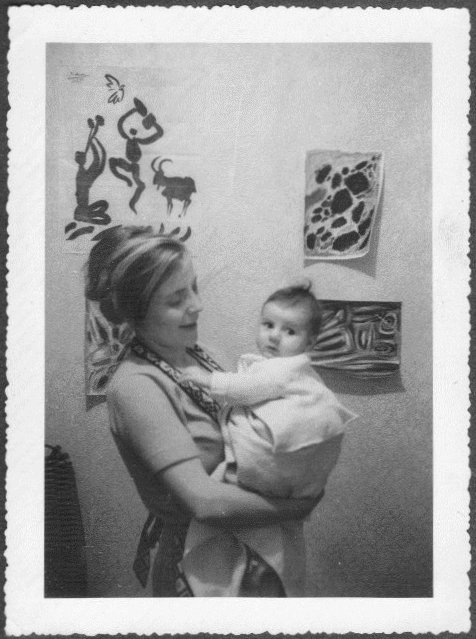 Then Dad invited her to visit our apartment in Asnieres on the outskirts of Paris where we were then living. Margot with Liz in Asnieres ca. 1960. So we’ve come full circle to the back of Notre Dame and my Dad and Mom, and Simone and me. This is what my Dad told me last night.